Business value is a conversation, not a number. Because critical decisions often directly affect the value generated or lost by an organization, it is helpful to organize the necessary information in the form of a business value model; this model can be created in a collaborative manner and revisited when the team gets new information. When it comes down to it, the business value model is really intended to structure the conversation about whether your project is worth it. Is it worth it to start? Is it worth it to continue? When making a decision about a project, there are a variety of things that can impact the value the project delivers. I refer to those things as considerations and group them into three categories. Assumptions: Those pieces of information the project you think are true, but are not certain. At points when the knowledge about a project is scarce, you have to make a lot of assumptions in order to begin planning. This is fine, as long as you note what those assumptions are, and check them on a regular basis to see if you have gained sufficient information to prove those assumptions true or false. Failure to do that could lead to some rather nasty surprises. Risks: Those things that possibly happen to your project or as a result of the project. Risks can be both good or bad, but it’s helpful to account for them either way. You want to think about how likely they are (probability), and what will happen if they come true (impact), then decide what you want to do about them. Constraints: Those things that put limits on the solution to the problem you are trying to solve. It’s helpful to establish the relative importance of the key constraints, and a technique called the constraints matrix can help with that. Considerations are hard-to-quantify factors you should include in your decision-making conversations. For example, will an initiative improve your product, service delivery, or organizational flexibility? This consideration is challenging to quantify, but may be incredibly important in your value decision. The result of a cost–benefit analysis remains an important input to your value model—but it is not the sole input to your decision-making process. In some cases, costs and benefits will inform your decision. In other cases, they will not. They should be used in decision making in conjunction with other factors, including the purpose of the initiative and the host of considerations that influence the value produced by the initiative. To help avoid the temptation of falling into cost benefit analysis paralysis, it’s helpful to think of costs and benefits from the perspective of the impact on business objectives. Costs are consequences of the action that works against meeting business objectives. Benefits are consequences of the action that contributes to meeting business objectives. Both costs and benefits can be identified in financial, or non financial terms, but either way they should be measurable. Remember, they are just pieces of information used to have the overall conversation about whether the project is worth it. Without value models, you risk deciding in favor of something that does not generate business value or deciding against something that does. Many of us try to put some structure around our decision-making process. The most common approach is to put the costs and the benefits through some type of calculation, which then spits out a number. This approach often fails because decision makers place too much emphasis on cost and benefit information that is an estimate, and benefit information that is a guess. 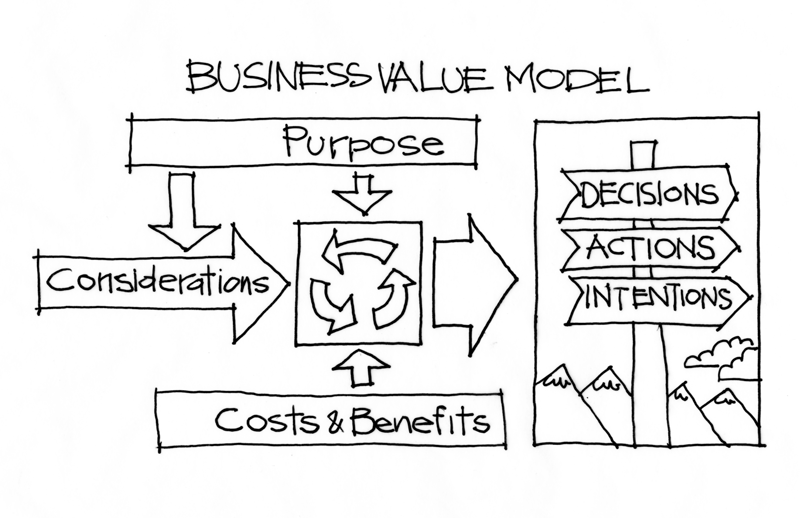 Business value models provide a clear advantage over the traditional decision-making models. They structure the conversation around a number of factors and are based on delivering value to the marketplace, thereby making the organization better in a meaningful way. Determine when these decisions need to be made. This time frame is usually based on time frames when options no longer become available, or when the cost of a delayed decision outweighs the value derived from making the decision. Determine which information is required to make an informed decision. Define the purpose, considerations, costs and benefits. Use the time until the decision needs to be made to gather the information identified in step 3. Organize this information in the form of a value model so that you are able to revisit your decision when the inputs change. Implement the decision as effectively and efficiently as possible. , Boston: Addison Wesley, 2009. Kent, this was a brilliant workshop you delivered this week at BBC 2102. Would love to download the latest slide deck with the great models you showed. Can you post a link? Is this still available anywhere? It has disappeared from this site. Yep. I updated the link. Thanks for asking.